Bottled water, flashlights, batteries and other staples were flying off store shelves across Puerto Rico on Tuesday as nervous residents braced for the arrival of Hurricane Irma — already one of the strongest storms ever recorded and currently packing 185 mph winds. 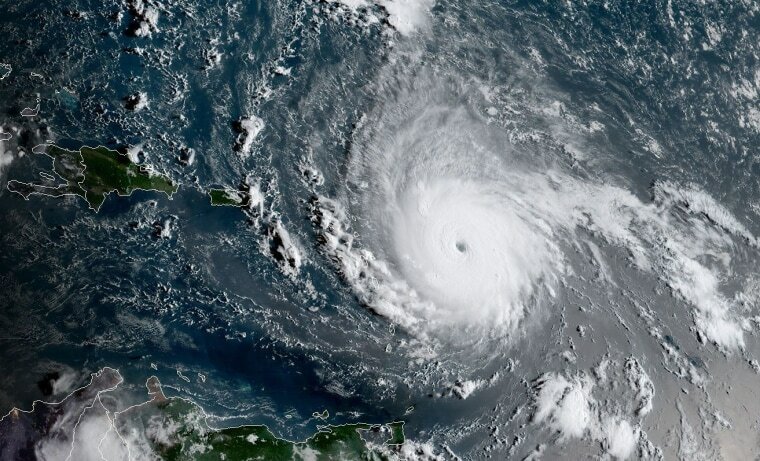 The Category 5 storm was churning toward the Caribbean and expected to make landfall in the U.S. Virgin Islands and Puerto Rico by Wednesday before sweeping across Cuba, the Dominican Republic, Haiti, the Bahamas, and the Turks and Caicos, the National Hurricane Center warned. Irma, which was heading westward at a speed of 15 mph, was expected to reach Florida later in the week and was already the same category storm as Hurricane Andrew, which devastated south Florida in 1992, killing 44 people and doing $25.5 billion in damage. In Puerto Rico, there were already long lines at gas stations in Gurabo, a small city 45 minutes southeast of the capital San Juan that is predicted to be in the path of the monster storm. Destruction likely to begin in the northern Caribbean in less than 24 hours. Puerto Rico's north shore will be in or very close to Irma's hurricane winds. Florida's fate largely depends on if Cuba weakens Irma first. All signs point to major or historic hurricane impact in South Florida this weekend. Tourists ordered to evacuate the Florida Keys starting at sunrise Wednesday. Miami Beach urges residents to prepare for possible evacuation. Classes were canceled and schools were being stocked with supplies and starting to accept residents from low-lying areas who were heeding the warning of Puerto Rico Gov. Ricardo Rossello to "take Hurricane Harvey as a lesson" and evacuate their homes. Flooding from Harvey claimed dozens of lives in Houston. Local police in Puerto Rico were going door-to-door in the most vulnerable areas to make sure there was no repeat there of the tragedies experienced in south Texas. Rossello declared a state of emergency on Monday, activating the National Guard, canceling schools and freeing up $15 million in emergency funds for the financially troubled island, his office said in a statement. The director of Puerto Rico's power company predicted that storm damage could leave some areas without electricity for four to six months. But "some areas will have power [back] in less than a week," Ricardo Ramos told radio station Notiuno 630 AM. The utility's infrastructure has deteriorated greatly during a decade-long recession, and Puerto Ricans experienced an island-wide outage last year. Meanwhile, at the Ralph's supermarket in Gurabo, manager Angel Luis Rodriguez Velazquez was presiding over a packed store. Triple the usual number of customers were packing their shopping carts with bottled water, canned meats and other products, batteries and "first necessity products" like diapers. "At this store, I've been working for seven years and it's the first time I see it like this during hurricane season," he told NBC News. "It been very fuerte [strong or difficult]." Irma was upgraded to a "potentially catastrophic" hurricane earlier Tuesday, the National Hurricane Center (NHC) said. And meteorologists warned the already dangerous hurricane could grow larger and stronger before it makes landfall. "We had Patricia a couple years ago in the Pacific and that had over 200 mph winds," Dennis Feltgen, an NHC spokesman, told NBC News. "Irma is definitely in that elite group of super powerful storms." Irma "is moving into waters that are warmer and [are] a very favorable environment for even further development," added Heather Tesch, a meteorologist for The Weather Channel. NBC News meteorologist Sherri Pugh said Irma "will be a strong storm and doesn't have much opportunity to weaken." "In the next 24 hours, I'm most concerned about the northern Leeward Islands and soon the Virgin Islands," Pugh said. The "storm surge is forecast to be 7 to 11 feet for most the U.S. and British Virgin Islands." Irma, which was about 130 miles east of the island of Antigua as of 5 p.m. ET Tuesday, was also expected to dump anywhere from 4 inches to a foot of rain and generate life-threatening flash floods and mudslides, forecasters warned. In Florida, all tourists vacationing on the low-lying Keys were ordered to evacuate starting at sunrise Wednesday. Gastesi said they also expect to issue a mandatory evacuation order for residents of the Florida Keys as well. In Miami Beach, the city advised residents to "begin evacuation preparations" in anticipation of an evacuation order. Earlier, Florida Gov. Rick Scott announced he was activating 100 members of the Florida Air and Army National Guard. He declared a state of emergency in all of the state's 67 counties, saying it was necessary for local governments to prepare immediately. And he asked President Donald Trump to approve an emergency declaration even before Irma makes landfall. "Current forecast models have Florida in Irma's path — potentially impacting millions of Floridians," he said in a statement. "While the exact path of Irma is not absolutely known at this time, we cannot afford to not be prepared." Florida's senators, Bill Nelson, a Democrat, and Marco Rubio, a Republican, urged Trump to approve Scott's request for an early emergency declaration "to ensure that full federal resources are made available." "As we recently witnessed with Hurricane Harvey, preparation and up-front resources are paramount," the senators said in a statement. Sunshine State residents appeared to be preparing for the worst. Images posted to social media from Naples, in South Florida, and Temple Terrace, outside Tampa, and Delray Beach on the Atlantic Coast, showed bare store shelves as well. "There's a drought in the water aisle and Home Depot is packed," NBC Miami reporter Ari Odzer joked on Twitter. At a Home Depot in Royal Palm Beach, a sign alerted shoppers that it was short on wing nuts and 5-gallon jugs for gasoline and water. A shopper there, David Graham, referenced Hurricane Harvey, which forced tens of thousands of people to flee to shelters and led to thousands of rescues. At least 48 deaths have been attributed to Harvey so far across six Texas counties. Graham told NBC affiliate WPTV of West Palm Beach, "People are being more vigilant, I guess." Mariela Santos is a freelance journalist based in San Juan, Puerto Rico. Bill Karins, Meredith Amor and Associated Press contributed.